Cornwall Walking. Whether your on a fortnights summer holiday and intent on walking the entire coastpath or just out for a pleasant winter or spring stroll on the Moors, Cornwall offers great walking. Here are a few suggestions. The Camel Trail runs along the beautiful Camel Estuary from Padstow the 6 miles to Wadebridge, and on , for the more adventurous, another 8 miles to Bodmin along a disused railway. The Cornish Coastpath The Coast of Cornwall, one of the most beautiful in England. From towering cliffs, windblown estuaries, superb surf beaches, fishing coves, harbours, to sheltered tree lined creeks, even an island topped by a castle. The Coastal Footpath makes so much of it accessible to the walker and hiker. Pentewan Valley Trail Near Mevagissey. A shorter version of the Camel Trail, along a disused railway, traffic free, and level. 3 miles. Penberth Cove to the Minack Theatre via Logan Rock. A circular walk taking in some of the nicest cliff scenery in West Cornwall. 3 miles. Fairly strenuous. Botallack and Wheal Owles Though it is difficult to image today Botallack once provided employment for over 1000 men, women, and children. In late spring the cliffs are a mass of bluebells and pink thrift. East Cornwall The Hallwalk Fowey to Bodinnick and hence to Polruan. 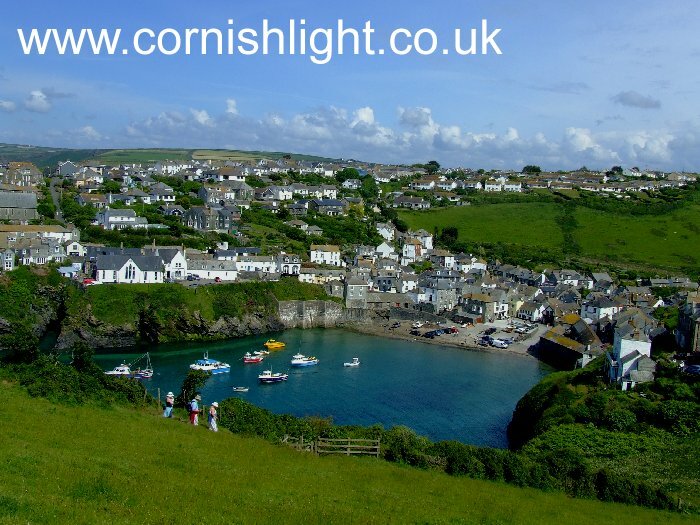 East Cornwall At any time of year one of the prettiest circular walks in Cornwall with wonderful views across the River to Fowey and down the estuary to Polruan. 2 miles. Wonderful walks are to be had in either direction along the Coast Path from unspoilt fishing village of Boscastle . Walk North to High Cliff, the highest point on the coast of Cornwall where you can look down on the wonderfully named Strangles. A strenous 3 mile walk (more a hike) across open moorland with some scrambling to reach the very top of Rough Tor. Rough Tor is the second highest point in Cornwall. Standing on its summit on a clear day it is possible to see to both the Atlantic North Coast and the English Channel of the South Coast. Magnificent all round views. Looking down on to the surrounding moorland strewn with the remains of a thousand years of history. Another walk offering great views is from Minions to Cheesewring. Today more than 40% of the County's Coastline is protected by the National Trust. There are 24 leaflets which feature detailed maps and are brimful of information on the history and wildlife, with superb line drawn illustrations . They are available from National Trust shops, or for a full list of titles telephone the Cornwall Regional Office (01208) 74281. To explore without them would be to miss out. Please read our disclaimer. Warning. Any activity has inherent risks particularly in the wrong conditions or with inadequate preparations or inadequate equipment. The information in this website is provided solely for your educational use, and SHOULD NOT be used as a substitute for actual training from qualified experts or experience or formal advice and guidance. Climbing, cliff or hill walking, and other such activities can be extremely dangerous and can result in injury or permanent disability or even loss of life. Participants and spectators in any activities are presumed to be aware of and accept the inherent risks which include but are not limited to those mentioned here and be responsible for their own involvement. Cornishlight and its contributors can not be responsible for the consequences of your participation, or the participation of those in your care,in such activities. If walking alone tell someone your route and when you intend to arrive at your destination for that day. Even at the height of summer you may well be fortunate to have a particular stretch all to yourself, with only the nature and wildlife for company. Though local authorities, landowners including the National Trust, make sterling efforts to maintain public rights of way stretches may become overgrown particularly in late spring Beware paths, at any time of year, may be loose, muddy or slippery, contain trip hazards, br blocked, obscured by overhanging branches or undergrowth, or even disappeared altogether due to erosion. Stiles, steps and barbed wire fences. Cracks may have opened up, overhangs formed particularly along the cliff edge. Any walk may involve encounters with traffic, and unpredictable livestock. Often paths skirt farm buildings or farmyards , or even make a detour altogether. Respect landowners rights to privacy. Keep dogs under control. Close gates and stiles. Please park in car parks not blocking field gates. Enjoy your walk.